An order router connection is made for each Market Segment ID per Market Segment Gateway (MSGW) session configured in hostinfo.cfg. The Market Segment IDs are provided in CME-MSGWs.cfg. 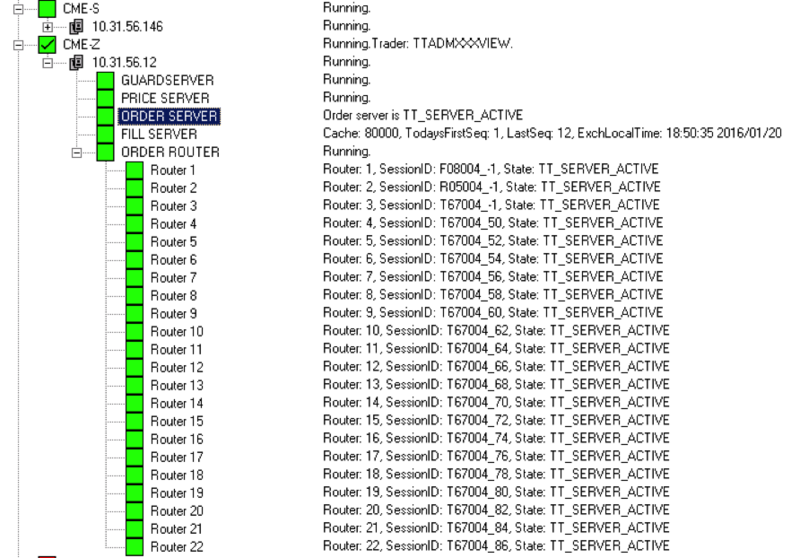 Each order router connection with corresponding Market Segment ID appears under the gateway Order Server in Guardian. 20.01.2016 12:43:51.850 | 592 | INFO | 10068024 | State for session(T67004_56) changed to (down). 20.01.2016 12:43:51.851 | 592 | INFO | 10098094 | GW: session(T67004_56) status = Down (Logged Out). If you trade a product in a market segment that is not configured in CME.MSGWs.cfg file, orders for these products will be routed via a Convenience Gateway (CGW) session. If a MSGW connection is not established, an X_TRADER® user will see the following reject message in their Audit Trail when the user enters an order or initiates an action on an existing order in the respective Market Segment: REJECT Cannot route order request. Session for router is down. Another way to check for connection issues, especially if you do not have admin permissions in your environment (e.g, X_TRADER ASP environment) is to check the Order Server log files, which contain messages that indicate connection status.